Ask any mum what they find most challenging when raising young children and they would probably come up with a similar list. Too much screen time? Tick. Wanting to hang out with their friends too often? Tick. Can’t get them to do their homework or chores? Tick, tick. For the group of 25 refugee women who gathered at our Dandenong office for a Parenting in Australia Workshop, these themes were all too familiar. But they also spoke of the added challenge of having children who were adapting to their new home – and speaking fluent English - much quicker than their parents, creating an ever-widening divide between parent and child. Another common topic was their children’s demands to buy ‘things’; which was causing conflict for families with limited means. One mum spoke of being a single parent of five children. Lacking English language skills or the ability to read and write meant that she was unable to find employment; providing for basic essentials was challenging enough. Most of the mums participating in the program had large families; in Melbourne the average number of children per family is 1.8 – but these mums had four, five, and even six children. Most of their kids were born in their country of origin, which for the group today included Afghanistan, Iran and South Sudan. Some of the children were born in refugee camps in transit countries such as Pakistan. 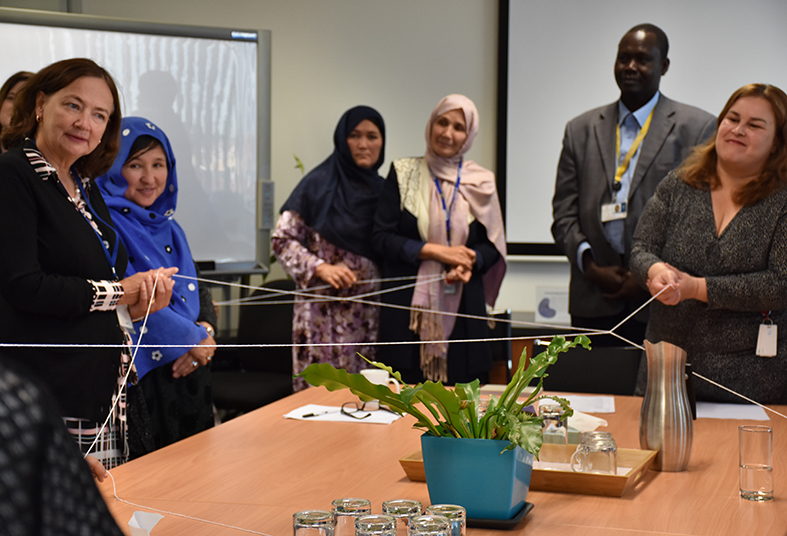 After escaping the violence and conflict of their country of origin, the mums are keen to understand how they can better help their children to make the most of the opportunities that life in Australia can bring. ‘It is interesting to hear the mums talk about their hopes and dreams for their children,’ said Lisa Foley, CatholicCare Senior Manager. Margaret Theologou, Manager Family Relationship Services, explained via an interpreter that when children are asked what they wanted most from their parents, their responses were surprisingly simple. Spending time together. Hugs. Love. The women shared their simple ideas for showing their children that they love them: brushing hair, watching a television program together, cooking a favourite meal. As they shared their ideas, they tossed a ball of wool from one to another creating a web to represent the importance of connection in building positive relationships. CatholicCare's Multicultural Parenting in Australia workshops aim to build connections between parents and children for a stronger family unit. We bring together different cultures to demonstrate that despite diverse backgrounds, relationships are at the heart of positive parenting and that sharing quality time together can make daily life easier - and more joyful for families. Find out more about our Settlement Engagement Transition Support for refugees.